This HDMI to HDMI scaler is a high quality digital video scaler that converts between different HDMI resolutions and frame rates. It offers high performance upscaling/downscaling with selectable HDMI output from 480p to 1080p or from 1024x768 to 1920x1200 pixels at various refresh rates. Perfect for resolving the issue between source and display equipment integration when the HDMI source resolution is not supported by the HD display. A simple on-screen display (OSD) allows users to configure the scaler with ease. 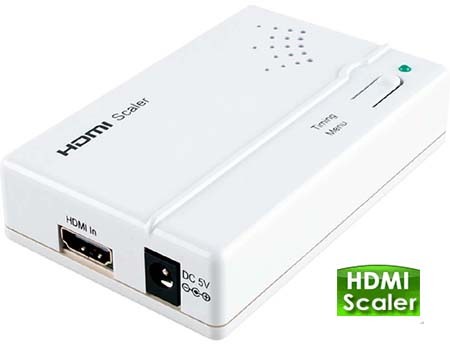 When the setup with multiple displays has compatibility issue, users can use this HDMI video scaler to down convert or up convert the HDMI or DVI feeds with a higher or lower output resolution for matching with the HDTV displays used instead of replacing the displays. The HDMI input and output on this unit are also fully backwards compatible with DVI-D inputs and outputs through using HDMI to DVI adapter or adapter cable. This HDMI video processor can automatically detect the HDMI input resolution and send out the desired or native pixel timing to match the TV display for optimal visual presentation. 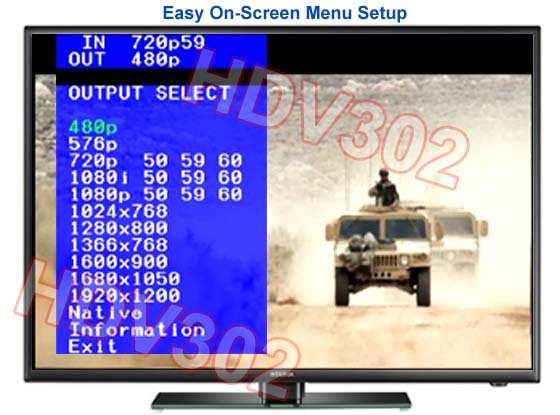 It is very flexible to accept SD or HD type HDMI inputs and output the desired HD or computer DVI RGB resolution for the display or further integration with other HDMI equipments. Image scaling and video format conversion are re-scaled on per pixel basis in order to deliver optimized graphics, fine text and crisp HD video. Advanced de-interlacing for all interlaced signals up to 1080p. This HDMI processor can accept a wide range of HDMI input resolutions from 480i to 1080p HD and from 640x480 to 1920x1200 pixels for PC. It is also fully backwards compatible with DVI-D inputs. 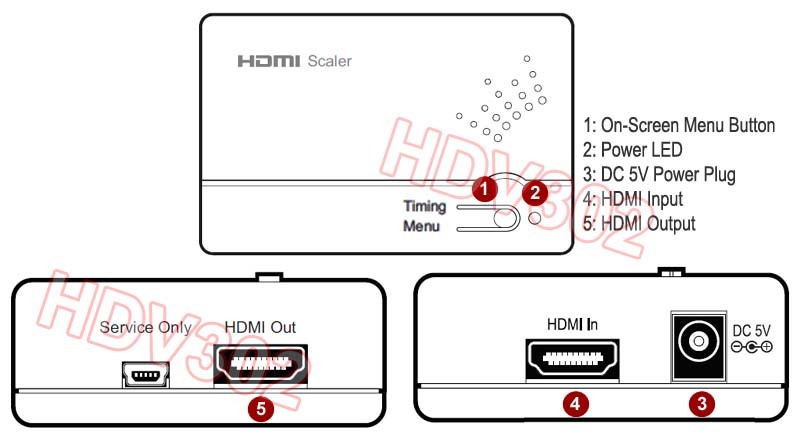 This HDMI scale allows users to select various HDMI output resolutions at different frame rates. Its HDMI output is also fully backwards compatible with DVI-D outputs through using HDMI to DVI adapter or adapter cable. The on-screen menu from the HDMI output of the unit allows users to configure the desired HDMI output with ease by pressing the push buttons on the unit. Main parameters such as current input/output info, output resolution selection, native resolution, information about source and display are all available to be scrolled through the on-screen menu. This digital video scaler ensures content-protected signal and interoperability with other HDCP-compliant devices. Powerful 3D video noise reduction technology is incorporated this digital HD video processor to minimize mosquito noise and block noise to minimize their bad influence on digitally encoded images. This HDMI scaler can auto detect the display's native resolution and offer users with native output to match with the display for optimal performance. This scaler adopts the advanced film mode processing technology which can help maximize the HD image quality that originated from film. High performance HDMI to HDMI scaler for all up-scaling and down-scaling applications. 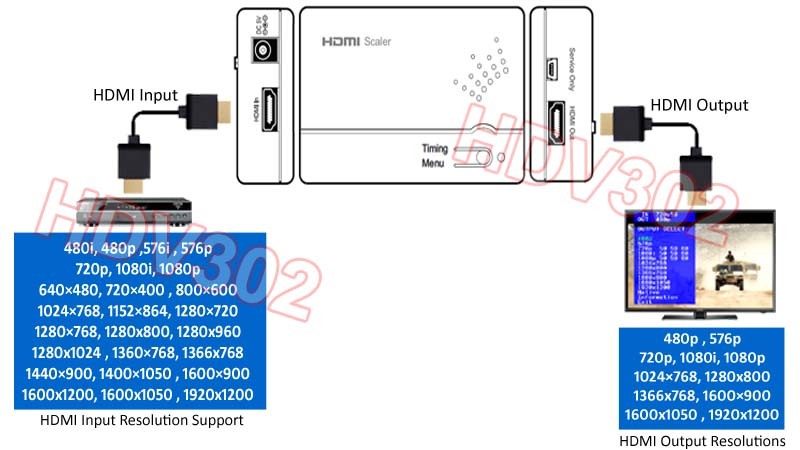 Selectable HDMI output from 480p to 1080p or from 1024x768 to 1920x1200 pixels. Easy setup through on-screen menu. 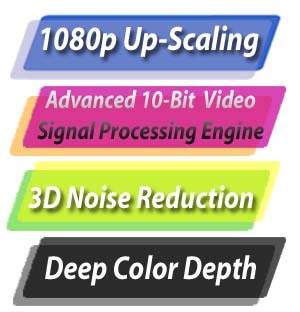 High quality scaling and conversion of HDMI video resolutions and frame rates. Automatically detects HDMI input resolution from the source and send out the desired or native pixels and timing to match with the HD display for best visual presentation. Accepts wide range of HDMI or DVI input resolutions from 480i to 1080p HD and from 640x480 to 1920x1200 pixels for PC. Advanced scaling engine with precision processing and motion-adaptive de-interlacing. 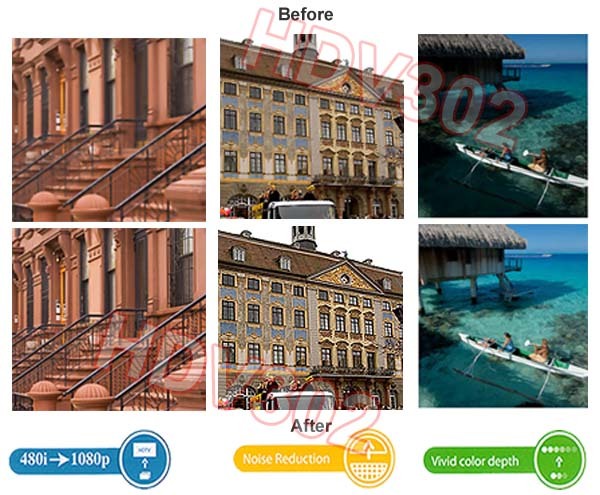 Smooth frame rate conversion plus adaptive contrast enhancement. Fully backwards compatible with DVI-D inputs and outputs through using HDMI to DVI adapter or adapter cable. Supports digital audio sampling rate up to 192 kHz. Automatic 3:2 and 2:2 pull-down detection. Supports 3D digital video noise reduction. Auto detect the display's native resolution and offer users with native output to match with the display for optimal performance. Universal switching power supply for 110V to 240V for worldwide use.